Another very easy card to do. These are the kinds of cards that are perfect for those beginner stampers. I stamped the snowflakes in Soft Sky and Blue Bayou. I stamped both images off as well to give the idea of two other lighter colors. 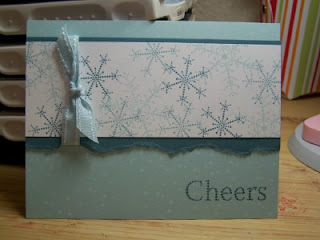 On the Soft sky card base I stamped the dots in Whisper White and then the Cheers in Blue Bayou. I added the snowflakes to a piece of torn buckaroo blue and some soft sky double stitched ribbon and Viola!